Should I correct Thanksgiving stereotypes my kids see on TV? Posted November 22, 2010 under Ask the Mediatrician. Q: My school-age kids have seen TV shows and movies that show inaccurate stereotypes of the first Thanksgiving—grateful Pilgrims and wild “Indians” and lots of peace and harmony. Is it my place to correct them? A: If what your kids are learning isn’t in line with your understanding of the actual story of Thanksgiving, start a discussion about what they’ve heard, and consider guiding them through these concepts that add nuance and accuracy to their understanding. Do kids in daycare watch more TV than kids who stay home? Posted November 19, 2010 under Ask the Mediatrician. What you heard about kids in daycare watching more TV than others is true when it’s a home-based childcare situation, but not when the children are at a childcare center. It’s not surprising that of these three groups, it’s the one supervised by people with the most training in child development that sets the strictest limits on screen exposure. My well-rounded teen wants to play violent, multiplayer games. Should I let him? Posted November 16, 2010 under Ask the Mediatrician. Q: My 13-year-old likes to play the Call of Duty games, and claims it’s not too violent, bloody, or intense for him—he just thinks it’s fun. Should I let him keep playing it? A: The answer to your question depends on what you’re concerned about. Given that your son is actively engaged in other activities, it sounds like you’re not worried that it might be getting in the way of other things in his life, so I suspect that your concern is about his exposure to and engagement with the game’s violence. Posted November 9, 2010 under Ask the Mediatrician. Recently, I answered a question from a mother who wanted to know whether she should be concerned that her teen son was spending several hours a day on Wikipedia. When the answer was featured on Ask the Mediatrician and discussed on the Center on Media and Child Health Facebook page, several readers challenged whether this boy’s intense interest in Wikipedia or excessive internet time was really that bad compared to other things he could be doing. I agreed with many of these comments and realized that I had not made my thoughts totally clear. How should I explain to my child that her favorite pop star is having emotional issues? 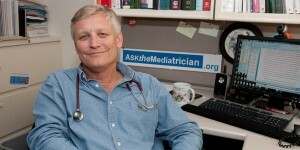 Posted November 4, 2010 under Ask the Mediatrician. Q: My 6-year-old adores singer/actress Demi Lovato. How can I talk to her about the reports that she is experiencing emotional issues and may have an eating disorder? How do I decide which health websites to trust? Q: Are there guidelines about how to find reliable health information on the web? A: Keep these three tips in mind when evaluating online health sources: Consider the ‘Rules of Media Literacy.’ / Ask yourself: What is this website trying to sell? / Visit multiple websites; compare advice. Is my son addicted to Wikipedia? Posted November 2, 2010 under Ask the Mediatrician. Q: My 16 year-old spends several hours a day on Wikipedia, reading and editing entries. I’ve searched for scientific papers specifically on Wikipedia habits, but all I find are articles on internet addiction. Should I be concerned? What can I do?